This is the harrowing, emotional story of Olaudah Equiano, The Father of Black Literature, who, in 1789, set out to end the slave trade. The Life of Olaudah Equiano is curriculum-linked both in the United States (Grade 8) and in Britain (History Key Stage 3 and Universities: The Enlightenment). Olaudah Equiano and his sister were among countless thousands of children who were wrenched from their African homeland in the 17th and 18th centuries to suffer the inhuman and degrading brutality of transportation and slavery. Transported to Barbados, Equiano was lucky to escape the fate of many, who were destined to toil and die in the shocking conditions of the West Indies’ sugar plantations. Equiano was bought by an English naval officer looking for a ‘blackmoor’ servant to impress his friends. Renamed Gustavus Vassa, he spent his teenage years serving the British Navy before the indurate captain sold him and he was returned to the Indies. His quick wits and sailing skills were soon appreciated by his new owner and through hard work and honesty he purchased his freedom and returned to England. Vassa worked with Wilberforce and the abolitionists to end the slave trade. 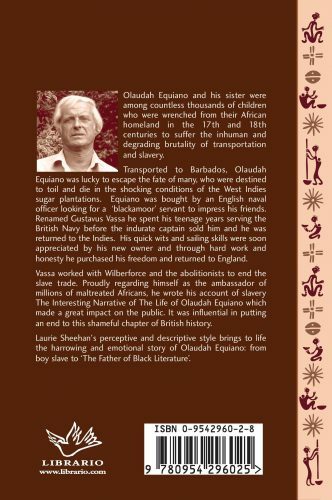 Proudly regarding himself as the ambassador of millions of maltreated Africans, he wrote his account of slavery The Interesting Narrative Of The Life Of Olaudah Equiano, which made a great impact on the public. It was influential in bringing an end to a shameful chapter of British history. 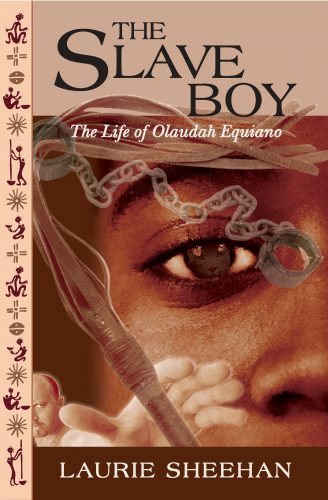 Laurie Sheehan’s perceptive and descriptive style brings to life the harrowing and emotional story of Olaudah Equiano: from boy salve to The Father of Black Literature.